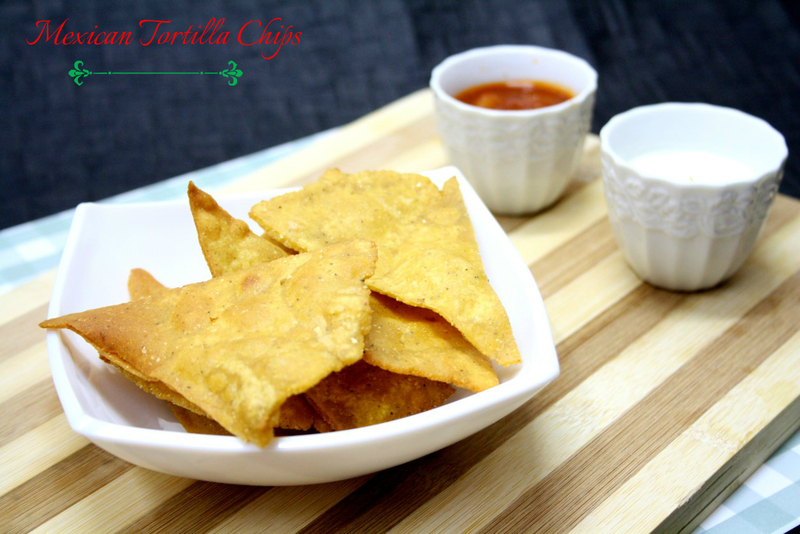 Learn how to make Homemade Tortilla Chips. And enjoy with some delicious Homemade Cheese Dip and Tomato Salsa Sauce! 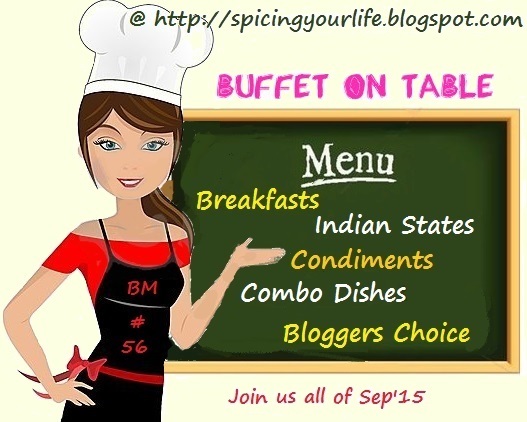 For the second day of Buffet On Table, with the combo Dishes being Tortilla chips with Tomato Salsa & Cheese Dip from Mexico. I love Mexican Cuisine. Maybe because it’s spicy and hot like our Indian Cuisines. However more because the cuisine has some very interesting snacks and bits like these Tortilla Chips served with cheesy dips and Salsas. I have been wanting to make these Tortilla Chips forever now! So many themes went by and each time something or the other came up. Even the last time when I selected to challenge with Tortilla Based dishes, the choices were many. 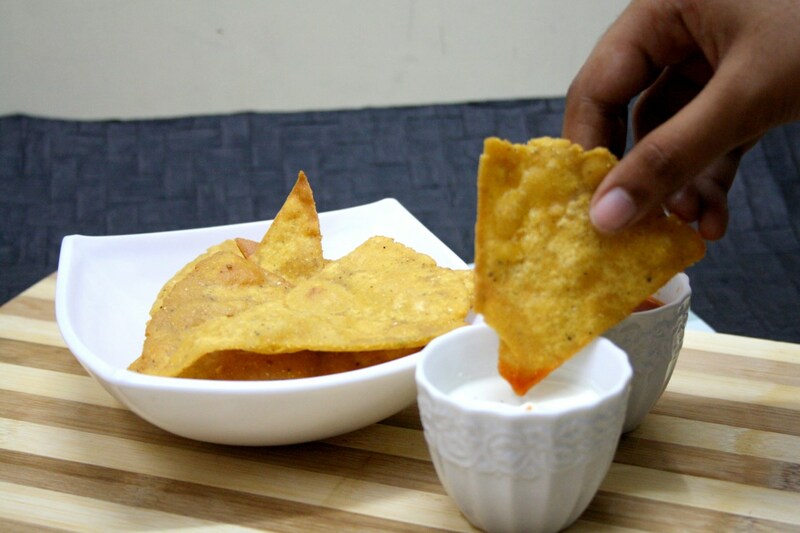 Still I had wanted to make these simple and addictive chips. Then I realized that I could make it for the Buffet and left it at that. Somehow until the last moment I didn’t end up making these chips. I even wanted to go all the way and bake these. Then I realized that I must first enjoy the deep fried version, then move on to low cal options. As one might know about me, I am not too much into low cal dishes or avoid deep fried dishes for my kids. I refrain from eating, but don’t want them to be deprived of that fun. Of course, I teach them about moderation and how to eat properly. All that again depends how receptive they are to listen to my gyan, when they binged on so much fun! 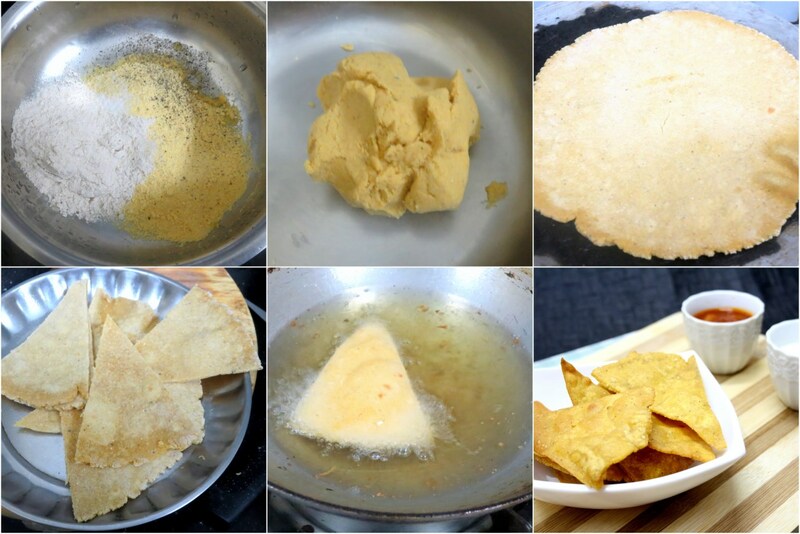 Coming to the tortilla chip, it is a snack made from corn tortillas, which are cut into wedges and then fried or baked. One can bake with any flat bread, infact with our own chapatis too. The moment I announced that I was going to make some finger food with some dips, I was not left in peace. I had to make these right away and it was also one of the reasons why I opted to deep fry these right away. I wasn’t ready to experiment in baking these in Microwave will result in crispy chips or chewy chips. That’s for next time. I served these with a choice of Tomato Salsa and an easy Cheese dip. If you noticed a red mark on the cheese dip, that was because Konda was so impatient for me to finish my shoot, and not seeing that I was still at it, started dipping it. I immediately felt that it made a great click as well. So you see the below two clicks posed by Konda herself. Boys enjoyed the munch on its own and were not keen on the sauce. However Konda was over the moon dipping into both. 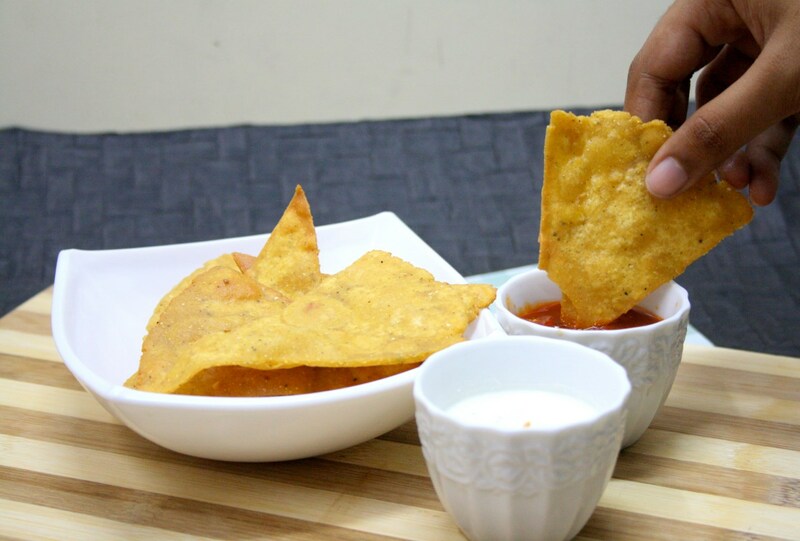 The traditional way of serving these tortilla chips is either as nachos with cheddar cheese and jalapenos or with some tangy tomato salsa, sour cream and guacamole. Since I am yet to try guacamole, I simply made the other two. Mix the two flours and knead to a dough like our regular rotis. Roll out thin rotis and cook on both sides, keep aside. Cut into desired sized pieces and deep fry till crisp and brown. The fried Tortilla chips stay crispy for over a week or two when stored in an air tight container. Regardless of how low calorie conscious were are, deep fried is always very tempting. Though I don't make deep fried food that often, when I do make I enjoy it to the core. I am yet to try the deep fried tortilla chips. I made the oven version few times. That is indeed a wonderful combo.Love that you made the chips at home. Surely these are addictive with the salsa and cheese dip! Looks so addictive with both the dipping sauces. Even I don't restrict my daughter from deep fried foods. There is so much time for them to go on diet. This is a favorite combo at our place. Though it is usually store bought tortillas, salsa and cheese sauce :). A splendid attempt, Valli. It's been a long while since I made these at home…I have become lazy and get them from a friend who makes them . The chips look crunchy and a perfect mexican combo with its side dips. Guess with such a delicious spread anybody would be impatient. Ohh home made tortilla chips looks so crisp.. Who say no to this combo that too with home made home made chips yummm..
Glad to know u made d Tortilla from scratch :)) this combo looks Delish ..
Wat a stunning combo, that too you made tortillas from the scratch, wish i could have some with that cheese dip, droolworthy comboo..
Wow.. Homemade tortillas are awesome..It must be tasty with cheesedip and tomato salsa..
Lol the patience our kids display… Pity them. This is an amazing tortilla. I will wait for your not fried version. This is a favorite in my family too. I usually have loads of store bought chips and salsa in my home that I rarely make them. I have tasted them at cinema halls vallI! Never made at home for the same calorie consciousness! !! ☺ I so love that cheese sauce!! Finger licking combo!!! 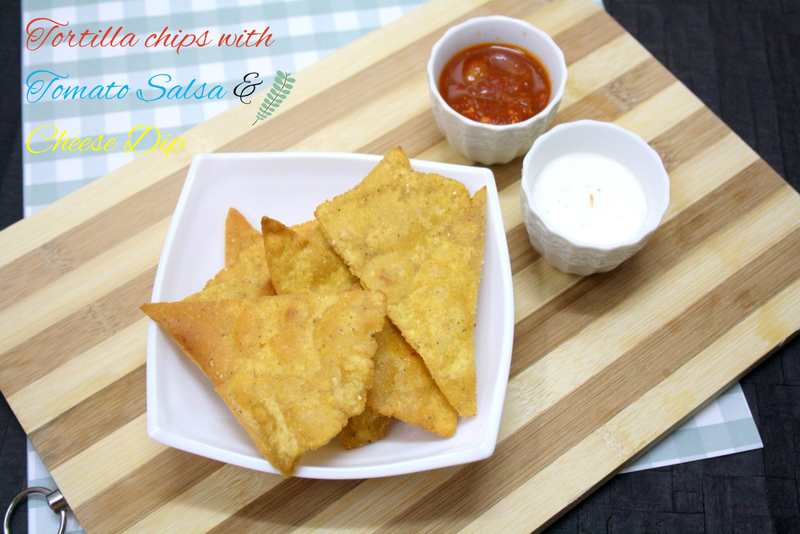 Home made Tortilla chips sounds very interesting and such an crispy treat to indulge with a spicy salsa 🙂 I remember in my childhood day Mom used to deep fry the leftover chapathi and we used enjoy them with pickle thats wat I call a desi tortilla now .. combination of corn meal would have made it more crispier isn't it.. gud one valli ! !